Happy Valentine’s everyone! I hope you have a very special day! I took the plunge and joined WW last night, online. I am going to try a meeting tomorrow night I think with a different leader than I am used to. I just can’t make it to her meetings so I have to do what I have to do right? I hope I like her. I told hubby for my V-day gift and my anniversary gift (which is next month) he can buy me WW months. I can’t really afford it but then I can’t afford not to either. I have gained 9lbs since coming back from Chicago. I am back into the mindset of “just this once” turning into a week long event! On the family front, the potty training has begun. Ugh. We got tired of asking him if he had to potty so we slapped on the big boy underwear and off we went. With in the first 30 min he peed through 2 pairs. I was thinking “Oh my gosh how much laundry will I have to do today”. Surprisingly the rest of the day was pretty good. Just one more accident but no poop. That is what I don’t want to deal with. I told him every time he pees on the potty he gets 3 treats (like 3 M&M’s), every poopie gets 5. Let me tell ya if you try to short him, he will tell you. Now that the week has begun he will be back in pull ups but I hope he tells the teachers and not go in the diaper. We will tackle it all weekend next weekend and see if we can’t get him in the habit. I would love for hubby to take like a Friday and Monday off to stay with him so we can get a good 4 solid days of it. Might have to think about my Mom watching him one week for me to help. I am so ready for no diapers! Okay well off to a new beginning this week and here is a new meal to enjoy! Have a super week. 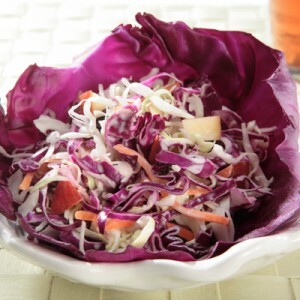 COMBINE cabbage, coleslaw mix, apple, mayonnaise, raisins, Juicy Juice, vinegar and salt in medium bowl; stir well. Cover; refrigerate for 30 minutes. Good for you! You’re taking a big step towards having a healthier you! I’m glad you are joining weight watchers! I’ve heard such great things and it will help you get back on track! Potty training is such a time consuming endevour… especially when there isn’t consistancy at school and home. Good luck with that!!! Good luck with WW. You can do it! Potty training is a huge deal, congrats on getting started. It’ll get easier (isn’t that true for all kid stuff?). Have a great week! Good for you for doing something with weight creeping on. Good luck with WW. Also good luck with the potty. I can’t wait to be out of diapers too. Essays like this are so important to briedanong people’s horizons.